We were introduced to grilled bun an’ cheese by Vancouver’s Chef Bounty...and it was divine. That got us thinking, why not bulla? 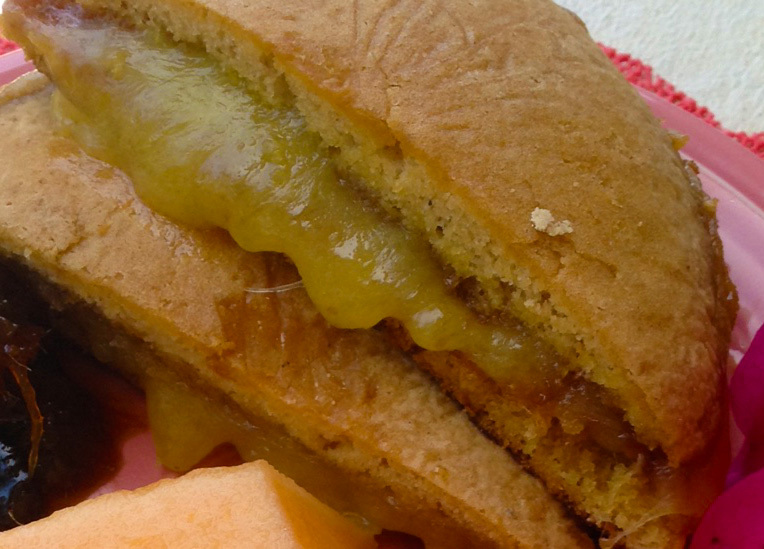 (See Glossary) And just like that a new Jamaican tradition was born – grilled bulla and bun an’ cheese. 1. Sift all together into mixing bowl. Make a well in the centre to add wet ingredients. Mix wet ingredients together and pour into the well in the flour mixture. Using a spoon, slowly mix until all is combined. Turn out onto floured surface and knead for a minute or two. Continue to pat and roll until you have a circle of dough about 1/4-inch thick. Using a biscuit cutter or a glass, cut into circles. Transfer to greased bak­ing sheet. Bake at 375 degrees F until golden brown and firm. * To get the gooey melted effect of the cheese without the risk of burning, microwave for about 30 seconds or so first.